"Evidence suggests that children and adults benefit so much from contact with nature that land conservation can now be viewed as a public health strategy." -Howard Frumkin, MD, and Richard Louv, author of Last Child in the Woods. If you haven't read it yet, check out Richard Louv's book, Last Child in the Woods . According to Louv, Nature not only teaches children science and nurtures their creativity, but Nature needs the children to become her future stewards. 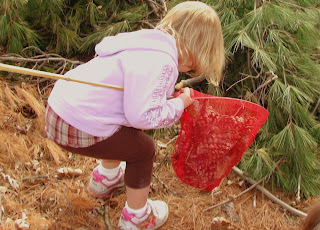 Sadly, because children no longer play freely outdoors, schools and child care providers must give them the opportunity to play and learn in nature. Isn’t experiencing life through personal discovery, and self-directed learning more enjoyable and exciting than listening to a recitation of facts? Facts, that may or may not be remembered after a day or two, no matter how interesting they can be. CHILDREN LEARN BY DOING!! If we all slow down and look closely, we will find many inspirations from nature. It surrounds us with beauty and bountiful gifts. It’s wonderful to take a walk, and look at the world around us, exploring pattern, color, texture and shape. 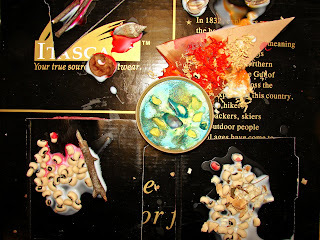 There are different ways to create a work of art using found objects from nature, my personal favorite is a three dimensional collage. 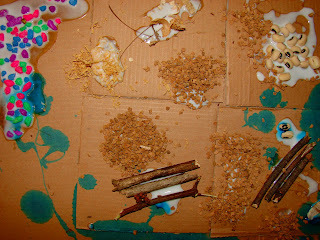 I have found that using natural objects is inspiring for children, and cost effective for my preschool. Lasting memories of how, where and when they found certain objects are imbedded in their minds. What a special art piece! 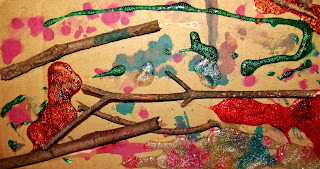 Nuts, twigs, shells, sand, pinecones, pods, small stones, wood shavings and pine needles. Dried flowers or fresh ones and leaves. 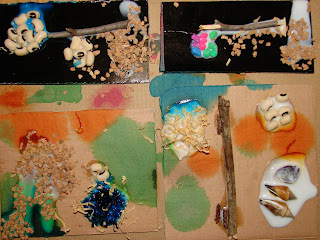 Each child worked with their hands to create a mixed media collage with a combination of liquid watercolors and items that we collected from the backyard. 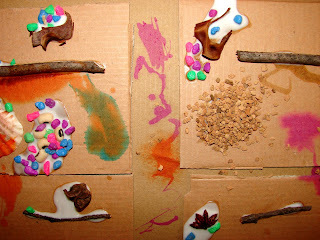 The children had total choice of color and items which they glued on recycled cardboard. These creations look beautiful. We love that the children had free choice to create as they wanted too without any adult direction ... as they should ... naturally! Maria ... It is because of the wonderful ideas you present to children and the number of people who enjoy what you share that we have nominated you today for our 'Honest Scrap Award'. We hope you will accept it on behalf of the both of us and every one you influence! Thank you for making a difference. all your ideas are so well presented - thanks! 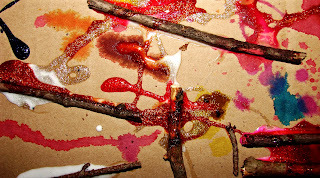 Could you tell about the pic at the top of your blog - all the colorful bottles etc and scare crows - is there a post about this?